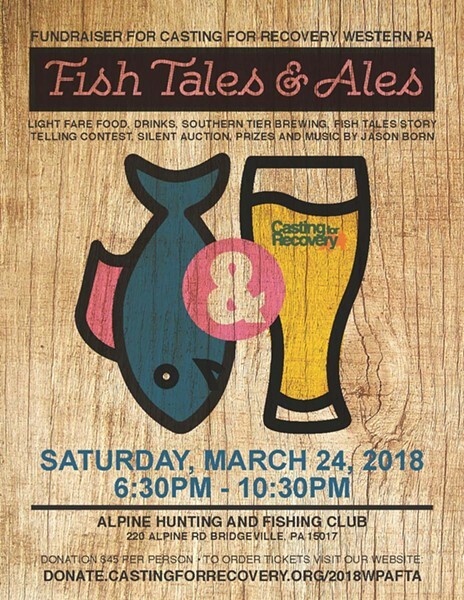 Come join us for the 3rd Annual Casting for Recovery Western PA Fish Tales & Ales! Tickets include light fare food, drinks, Southern Tier Brewing, great silent auction items, and entertainment by local musician, Jason Born! Back by popular demand - Get your best 5-minute Fish Tale ready! Put your name in at the door! 5 lucky winners will be drawn to tell their best Fish Tale! The best story by audience applause will win a prize! All proceeds benefit the Casting for Recovery Western PA Program!